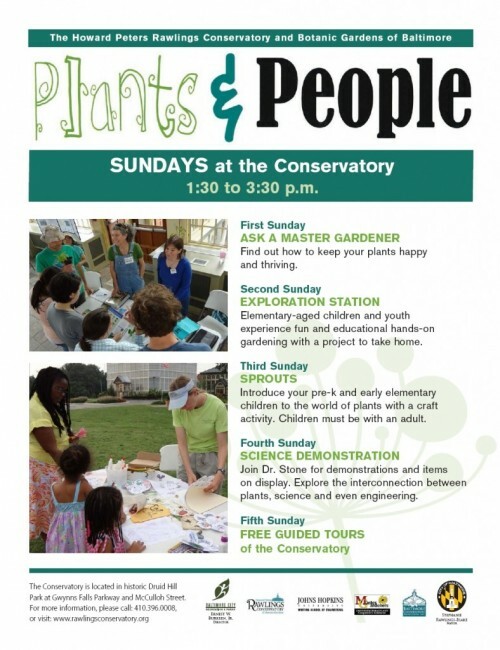 The Plants and People Program is open to the public and all visitors are welcome. The programs are interactive, informal and experiential opportunities for visitors to learn about plants, Baltimore gardening, and the conservatory environment. The first Sunday is “Master Gardener Clinic”, the second Sunday is “Exploration Station,” which is geared towards elementary-schoolers and youth , the third Sunday is “Sprouts,” which is geared towards preschoolers, the fourth Sunday is “Science Demonstration,” which is great for all ages, and the fifth Sunday is “Guided Tours of the Conservatory.” Each month, there is a different theme or topic of interest. Children must be accompanied by an adult. Programs are free and run every Sunday 1:30-3:30pm. Programming is free, though a $5 per person donation is encouraged.